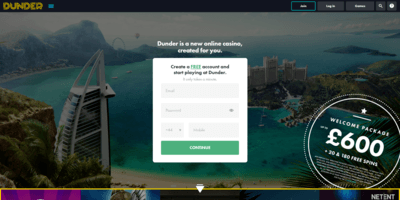 Dunder Casino features over 2,500 slots to choose from, many that have realistic details instead of those that have a cartoon quality. You can create a free account to begin playing games with a few bonuses given after depositing money or playing your first games. There are several games that are available from the leading casinos across the internet as well as some that are seen only at Dunder Casino. Have fun playing at any time on your mobile device with the mobile casino. A live casino is also a fun feature that is offered. You can receive notifications from both features. These notifications include when there are new games or when there are new bonuses. Some of the games that you can play include Starburst and Gemix. While most of the games are slots, there are also some that involve matching designs and cards. A welcome package is offered when you open a new account. This package includes free spins that can be used when you play almost any of the slots. This is one of the few casinos that allows PayPal to be used for withdrawals and for adding money. You can also use credit and debit cards. The payouts are usually completed in less than 24 hours, giving you an opportunity to get the money that you have won from the games without waiting for a long time. Some of the slots have straightforward pay lines while others have lines that can be confusing. This makes it difficult to determine if you’ve won or not, but many slots try to use different colors for the multiple lines so that you can tell where each one is located. A multiplier is good to use if you haven’t won anything after a few reels. It can mean more money when you do win. Start by adding small amounts of money to your account until you understand the games as some make it easy to lose funds if you don’t know what to look for while playing. A live chat option is available if you have any questions about the games or the bonuses. You can also ask questions about the payouts and when you should expect money in your account. The signup bonus can be as high as 200 percent. There are bonuses given for the first deposit as well as the second and third, but the percentage decreases with each deposit that is made. Get 20 bonus spins in Starburst. No deposit required. No deposit bonus spins expires 7 days after sign up. Wagering requirement 25x. 18+ only. Terms and conditions apply. Gambleaware.co.uk.